A cabside number-plate from loco no. 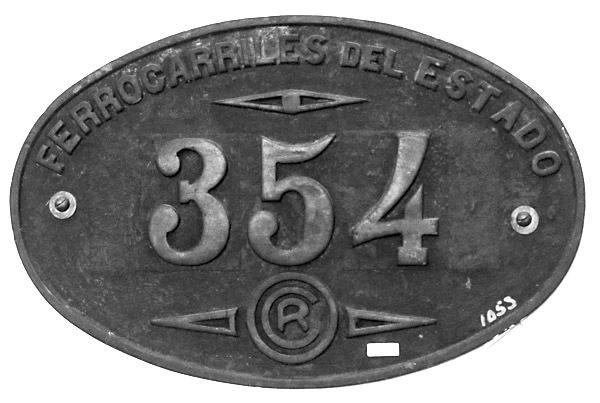 354, showing the CR (Comodoro Rivadavia) logo withing the circle at the bottom of the plate. 12M class Pacifics 4-6-2. Built new for FCE. Cylinders 500 x 630mm; dr. wheels 1600mm; bp 12 kg/cm2; TE 10040kg; 4 axle bogie tender weighing 21 tonnes empty. All up weight in service 116 tonnes. Superheating added from 1926. To PtoDes first (RC). On roster here by 1934, and in ’45, '56, and ’60. Involved in accident 14/10/59. On roster 1934, ’45, '56 and ’60. To SanAnt (RC) before 1934 (or in 1939? ), & there in ’45 & '56. On roster 1934, ’45, '56 and ’60. Boiler sent to San Antonio for repair 58-60. Class 11S 2-8-0, originally built as 2cyl. compound for FC Sud. Running nos. of 11S class were 4080- 97; Purdon suggests 4094 was the loco sent south. Arrival recorded in EFE Argentino Memorio 1962/3, page 61: " 1 loc.carga serie 11 Nro. 4030 convertida a serie 11S Nro. 4075 (sic) y transferida a Linéas Patagónicas zona Puerto Deseado". Information from Señor S. Damus. New 4-8-2. Cyls 24 x 28, DW 5' 9", BLW class 14.42 1/4.E.1. Not here in 1934 or ’45. Ex FC Andino 0-6-0 nos 17-18. Purchased by FCE in 1909, at a price of $oro 5,740 each. Ex NW Argentine 0-6-0T nos. 6-7, sold to Beltran Cavalry Depot 1896., later N. W. Arg. nos 19-20. Cyls. 15 x 20, dw 3' 5"
Ex FC Andino 0-6-0T no. 3. purchased by FCE in 1909, at a price of $oro 3,718. Cylinders 386 x 558mm; dr. wheels 1040mm; bp 8 kg/cm2; TE 4269 kg. On roster 1934 & ’45. Originally named 'Las Heras'. JD suggests this ran at PtoDes. Ex ??? 0-6-0/3. Purchased by FCE in ?? ?, probably 1909, but not recorded in 1912 report. Cylinders 449mm x 610mm; dr. wheels 1395mm ; bp 11 kns/cm2;TE 6474kg. 3 axle tender weighing 14tonnes empty. On roster 1934, but not 1945. Present, but to be scrapped, in 1956. Cylinders 321 x 438 mm(12 1/2 x 17 1/4"); dr. wheels 1000mm(3' 3"); bp 8 kg/cm2; TE 4487kg. On roster 1934 & ’45, but possibly sold later to 6th battalion railway engineers & preserved at Retiro. (JD) Present in 1956, in use as stationary boiler at Sarmiento, but to be scrapped. Ex FC Central Argentine 0-6-0T 'X' 255, but not recorded in 1912 report. Ex contractor (purchased it 1900), ex CAR (purchased it 1891) (no. 255), ex its original purchasing contractor. Cyls. 13 x 18", DW 3' 7". Not certain which line this loco went to (RC/JD). Not here in 1934 or ’45. Not on roster in 1934 or ’45. Data in this table initially from Reg Carter's lists. Railways of Argentina -loco lists. 46 Mill St. Kingston upon Thames, Surrey, UK. Details of locos surviving in 1934/45 confirmed from FCE Appendices to working timetables. 1956 details taken from FCP data sheet for Comodoro Rivadavia. Confirmation of locos on the line in 1912 is from Memoria del Ministerio de Obras Publicas de la Nacion Correspondiente al año 1912/13, Capitulo II, Anexo L.
All locos present in 1945 were recorded as oil-burners. The works plate from Cockerill pacific no. 2758, as currently mounted on the tank of Manning Wardle 0-6-0T no. 1351 preserved at Comodoro Rivadavia station.